I love the sound of a train whistle in the distance, and the click-click-click of a train going by. In the distance. My house in Glendale, Arizona is just a few miles from the train tracks and I love it, especially at night. There's such a wonderful, lonesome sound of a train passing. In the distance. Of course, if it were a few feet away from me, I'd think differently. The sound of a train whistle right nearby late at night, or the clatter of a train going by every closely is annoying loud. And trains are dirty, they burn diesel fuel, and before diesel it was even worse, pouring out black smoke, and soot. And that's why it's always puzzled me that some of the most expensive real estate in Santa Barbara is right next to the railroad tracks, near the beach. It made me wonder if people "back in the day" didn't mind being woken up by the noise of a train going right past their house. Or if somehow they weren't bothered by the smell, and the smoke. But it's not that at all, it's the change in the past 100 years about being close to the beach. Nowadays, of course, we want to be right near the beach. Closeness to the beach is all the rage - people who have houses so close that they can walk to the beach, or have a view of the ocean right at the beach, are considered lucky. 100 years ago it would have been the opposite. If you've spent much time in Santa Barbara, you know it's windy. Down by the beach at night it's windy, damp, and unpleasant. The beach is an unprotected area from strangers, too, dark and lonely. 100 years ago it would have been the last place that you would have wanted to live if you could afforded to live inland a bit. And that left the beach area pretty much open, and unwanted. Left to people too poor to live elsewhere, and transients, and tramps. And that's why the train tracks are there. They were built long before attitudes about living at the beach changed. When the attitudes started changing, in the 1920s, the building started close to the beach. Luxury places, fancy hotels. Go visit the Santa Barbara Biltmore, the train tracks run right next to it. 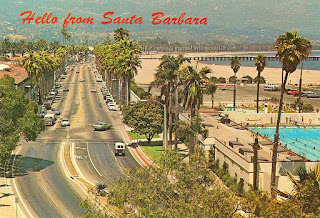 Take a look at the Santa Barbara Hilton, same thing. Train tracks. And where the Hilton is was empty and unwanted right up through the '80s. It's where the bums used to sleep. Of course it's too late to move the railroad tracks now, so they do the best they can. And hopefully people staying at these luxurious resorts will just consider the train going by, seemingly inches from their windows, to be part of the charm of Santa Barbara.